Netflix is headed back to Prince Edward Island. 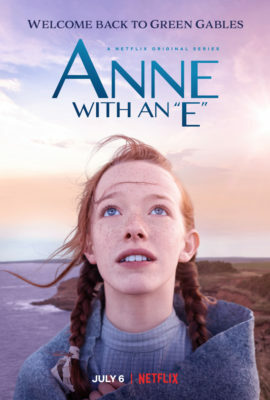 This week, the streaming service released the premiere date, poster, and a new teaser for season two of Anne with an E.
Based on the Anne of Green Gables novels, the Canadian drama centers on 13-year old orphan Anne Shirley (Amybeth McNulty) and her adventures on Prince Edward Island. The cast also includes Geraldine James, R.H. Thomson, Dalila Bela, Lucas Jade Zumann, and Corrine Koslo. Season two of Anne with an E debuts on Netflix on July 6th. The new season will premiere in Canada on CBC on September 23rd. Los Angeles, USA – June 8th 2018 – Netflix, the world’s leading Internet entertainment service, announced today that the universally acclaimed series Anne with an E returns for a second season on July 6th. The expanded ten episode season from Miranda de Pencier’s Northwood Entertainment launches exclusively on Netflix everywhere, excluding Canada (where it debuts this Sept. 23 on CBC). All episodes will be available all at once to members around the world, outside of Canada. Inspired by the timeless Canadian novel “Anne of Green Gables” by Lucy Maud Montgomery, the second season of Anne with an E continues to chart bold new territory, adding new characters and storylines while further exploring themes of identity, prejudice, feminism, bullying, gender parity and empowerment through the lens of its fierce, starry-eyed, irrepressible 14-year-old protagonist. A coming-of-age story, reimagined by creator Moira Walley-Beckett, Anne with an E stars returning fan favorites Amybeth McNulty (Anne Shirley-Cuthbert), Geraldine James (Marilla Cuthbert), R.H. Thomson (Matthew Cuthbert), Corrine Koslo (Rachel Lynde), Dalila Bela (Diana Barry), Aymeric Jett Montaz (Jerry Baynard), Lucas Zumann (Gilbert Blythe) and Kyla Matthews (Ruby Gillis). This season introduces audiences to new characters including Dalmar Abuzeid (Sebastian Lacroix) and Cory Gr�ter-Andrew (Cole MacKenzie) conceived by Moira Walley-Beckett and an all-female writers’ room. What do you think? Are you a fan of Anne of Green Gables? Will you watch season two of the TV show? More about: Anne with an E, Anne with an E: canceled or renewed?, CBC TV shows: canceled or renewed?, Netflix TV shows: canceled or renewed?